Dean Baquet, the Times’ executive editor, told an interviewer the Rutenberg article “nailed” his thinking and convinced him that the struggle for fairness was over. Nearly every prominent news organization demonized Trump and endorsed Clinton. This was and is a disgraceful chapter in the history of American journalism. Even when confronted with proof of falsehoods by the media, there has been no change in behavior. The project initiated by the Boston Globe encouraged newspapers across the country to stand up for press freedom after Trump called journalists “horrible, horrendous people” at recent rallies. They insisted they were joining together to protect the First Amendment and freedom of the press. The effort looked like self-interest masquerading as principle. True to form, most of the papers expressed their hatred for President Trump and some went so far as to extend the contempt towards his supporters. Can you imagine - 63 million Americans just written off because we disagree with the liberal media ideology? This reminds me of Clinton’s “deplorable” comment or California Gov. Jerry Brown comparing President Trump’s supporters to ignorant cave dwellers. 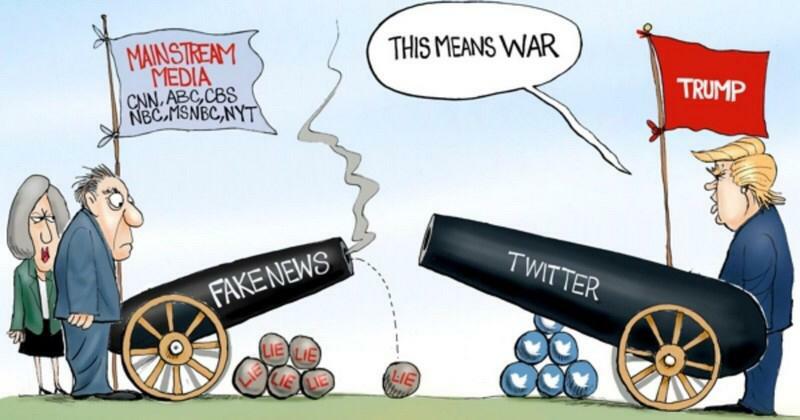 The media refuses to see their destructive role in the war with President Trump. They show no remorse over the relentless hostile coverage of Trump and the damage it is doing to the nation. Studies show that 90 percent of TV news coverage is negative. The Times, Washington Post and CNN, among many others, are addicted to Trump hatred as if it is a drug. The lack of balance permits little to no coverage of his achievements, of which there are many. How many people know that the employment records have been shattered by the jobs boom unleashed by Trump’s policies? Black unemployment stands at 5.9 percent, the lowest rate on record. Latinos unemployment is at 4.5 percent, also the lowest on record. Women’s is at the lowest rate in 65 years and for young people, it’s the lowest since 1966. The statistics mean millions of people are getting a chance at the American dream. Why is this not newsworthy? Rest assured that if Barack Obama had achieved these milestones, the media would have fallen over themselves trying to be the first to honor him. They would have given him a medal. In 2009 the Nobel Peace Prize was awarded to Barack Obama for his "extraordinary efforts to strengthen international diplomacy and cooperation between peoples." President Trump gets ridiculed for trying to strengthen international diplomacy and cooperation between peoples. When it comes to Trump, nothing is ever good enough. Having a preconceived opinion that he is unfit to be president, newsgroups ignore or distort the facts that contradict their view of him. While the media manipulation does hurt Trump’s popularity, there is an ironic impact: The skewed coverage is doing more damage to public trust in the media. A Gallup/Knight Foundation survey of 1,440 panelists found adults estimating that “62 percent of the news they read in newspapers, see on television or hear on the radio is biased” and that 44 percent of “news” is inaccurate. Among Republicans and GOP-leaning independents, an astonishing 92 percent distrust the media, as do 53 percent of Democrats. Two-thirds of those who believe there is false news say it usually happens because journalists “have an agenda.” This distrust is not limited to Trump supporters. These percentages reflect a crisis of confidence in the press. A Gallup survey three years ago found that 40 percent trusted the media; two years ago it declined to 32 percent. Now, look where they are. Instead of examining their conduct, the media has increased their hatred, apparently believing that screaming louder and longer will lead the public to hate Trump as much as they do. This only drives them closer to him. If he is as bad as they make him out to be, why do they have to lie? The truth should suffice. I don’t understand the media fixation on Obama. The list of Obama failures is beyond measure. He was and remains the worst President we’ve ever had. His objective was to bifurcate and destroy America, and he damned near succeeded. The media has picked up where he left off. To the liberal biased media, you best get on board because Trump is on fire. He is making America great again. The MSM is nothing but Propaganda. I don’t believe a word they say. I get my news from the President. Keep these articles coming. The public has a right to know what liars they are. History will reflect back on this time as the election that wasn’t supposed to happen according to msm and that the msm was working hand in hand with our corrupt doj & fbi to unseat a duly elected President. Maybe it will get coined the mueller coup? msm is truly not only the enemy of the people, their the enemy of the world! Proven by the fact they lied to the American people in order to start two false wars that killed millions! Their owners and their corrupt reporters should be on trial for war crimes! remember: the mainstream FAKE NEWS covered for THE REAL 9/11 terrorists, BushCo.